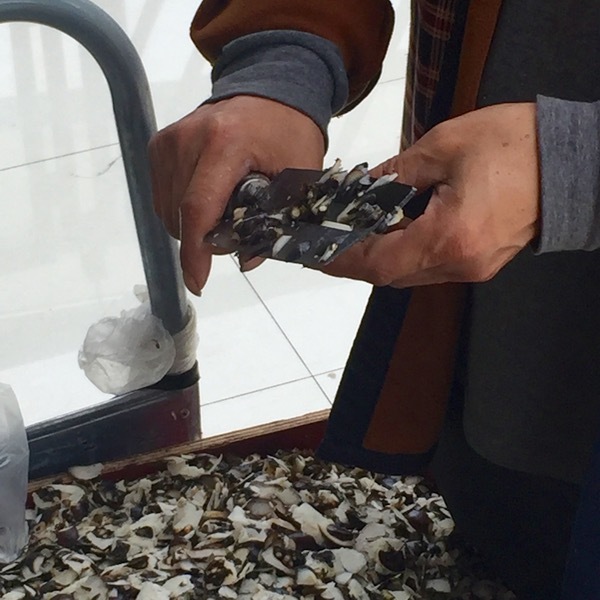 We were in the middle of the most ginormous wholesale mall on the planet in Yiwu, China. Or at least that’s what it felt like. Having walked a good 12 kilometers so far that day, with a bum foot, I was relaxing on a bench while our managers were scouring stores for more stuff we needed to buy for the restaurants. And along comes this vendor, pushing a cart down the hallway on the fourth floor of the building! 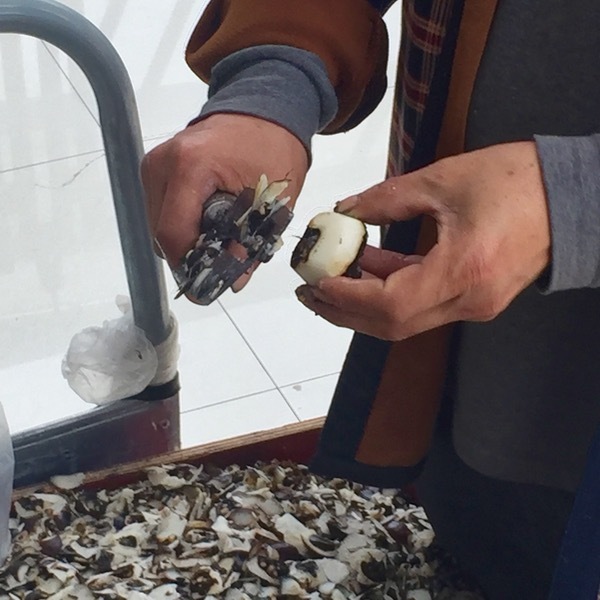 He stopped a few feet away from me and started peeling something as several customers came up and bought little bags filled with small little fruit or vegetables. 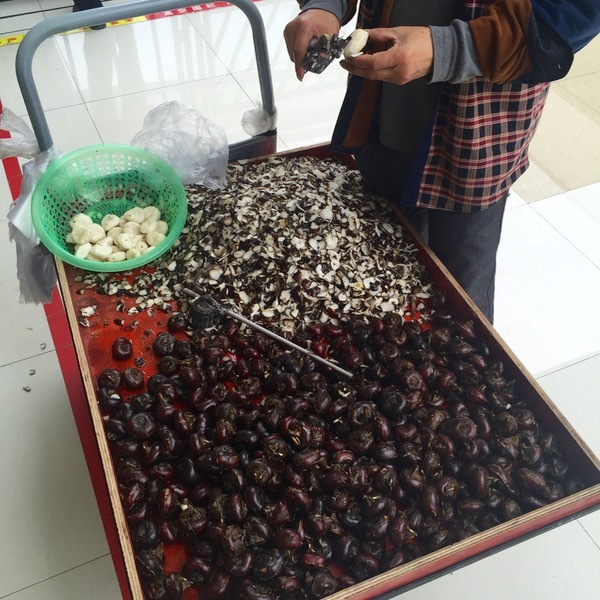 On closer inspection, it turned out to be freshly harvested water chestnuts. The peeler was a bit intimidating, much bigger than a standard western kitchen peeler, but it seemed to do the job well. I was worried that he would shave off part of his finger as he made quick work of the peeling, while smoking a cigarette, no less. Whenever obtainable, any self respecting cook should insist on using fresh water chestnuts. The tinned ones might be cheaper if not more convenient since they come already peeled and ready to use but it’s just a poor substitute, a pale shadow of the real thing, drained of all flavour and sweetness and most of its crunch. 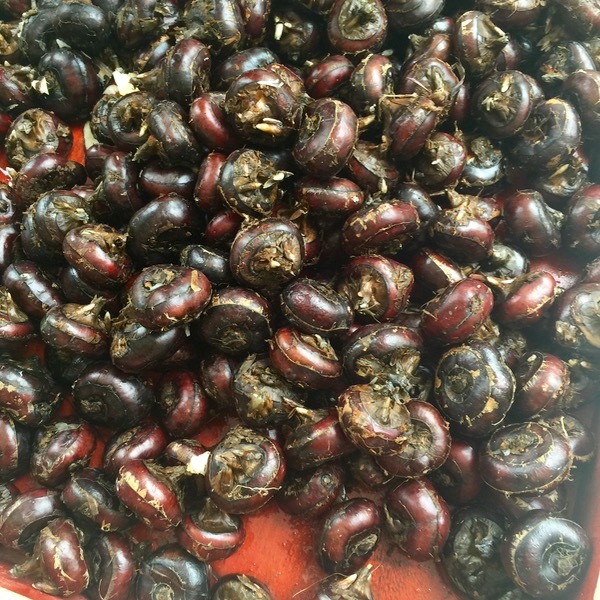 We call them apulid sungsong since they are the giant version of the tiny native corms of swamp grass that are boiled and eaten like boiled peanuts which then leave black debris lodged between the teeth. Sungsong, of course, is a modifier than means originating from China and generally implies significant improvement over the locally grown variety. Footloose,Sungsong for me are the dried salty peanuts in shells that my mom bought from Binondo! :) I learned to love apulid because my mom used to put it in her chicken pastel or lumpiang shanghai for some crunchiness! 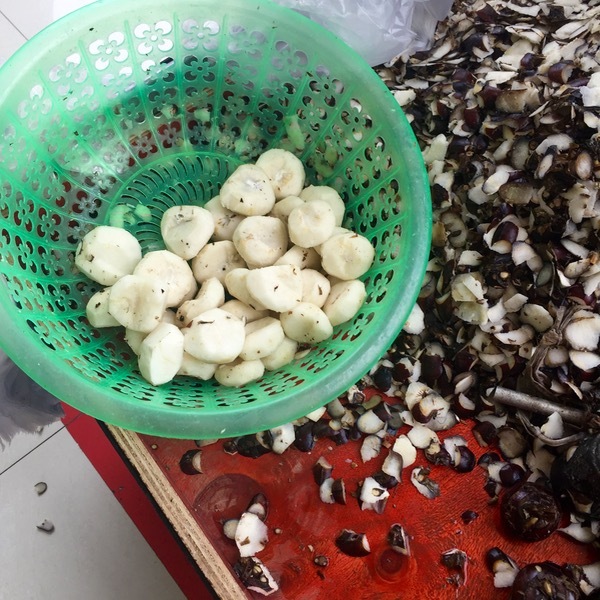 I’ve been to Singapore (not China though) and found these water chestnuts in the supermarket. We’ve put them in the tinola, chop suey, lumpiang shanghai and more. For however you’d want to cook them, they are still crunchy and taste somewhat sweet. It’s like singkamas but a little sweeter and smells better. When I flew back home, I had to bring some with me.